Visionary director Ang Lee brings one of the most beloved books of the past decade, Yann Martel's LIFE OF PI, to the big screen. The LIFE OF PI Movie Companion introduces readers to the epic adventure by incorporating excerpts from the novel with breathtaking images and scenes from the film. 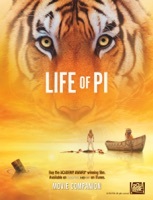 LIFE OF PI tells the story of a teenage boy names Pi who survives a devastating shipwreck and embarks on an impossible voyage across the Pacific accompanied only by a fearsome Bengal tiger. Lost at see, the two make an unexpected connection on a remarkable journey of courage, hope and triumph. Highlights from the Movie Companion include a video introduction with Yann Martel and Ang Lee, the stories behind Pi and the tiger as well as an exciting look at one of their most extraordinary confrontations. The LIFE OF PI Movie Companion gives you the opportunity to experience Pi's incredible journey. The ACADEMY AWARD® winning film is available on iTunes. 25 histoires, 25 auteurs en 140 ca.